We have been using the Samsung Galaxy S from over a month and have written a huge number of articles related to the same. Here are some of the quick links to the same – Sync Samsung Galaxy S, Delete or replace default dock icons, Setup Lost Mobile tracker, Check Battery usage & history & Root Samsung Galaxy S.
In this article we will be giving you a list of different tips and ideas on how you can use the 5Mp camera which comes with the camera and take beautiful snaps from the device. Before we start into this you will have to know that the Galaxy S is powered with a 5 Megapixels Camera which can take snaps with a resolution upto 2560 x 1920 pixels and along with this you can also take HD Videos with resolution upto 1280 x 720 pixels. In order to capture a Photo on your Galaxy S you will have to tap on the application list and then tap on the ‘Camera’ Icon. Once the application opens you should tilt the device to make the app display in landscape mode. In the normal portrait mode you can just take snaps directly but while using in the landscape mode you will be able to get all the options displayed on the screen. Displays the Resolution, amount of storage left in the form of number of Photos you can take which is linked with the quality set. Also a small icon displays the location where these Photos are stored ie Internal Phone Memory or else the external SD Card. This option is going to allow you to change the default shooting mode which gives you a list of different options ranging from Single Shot, Self Shot, Beauty, Smile Shot, Continuous, Panorama, Vintage, Add me, Action Shot & Cartoon. 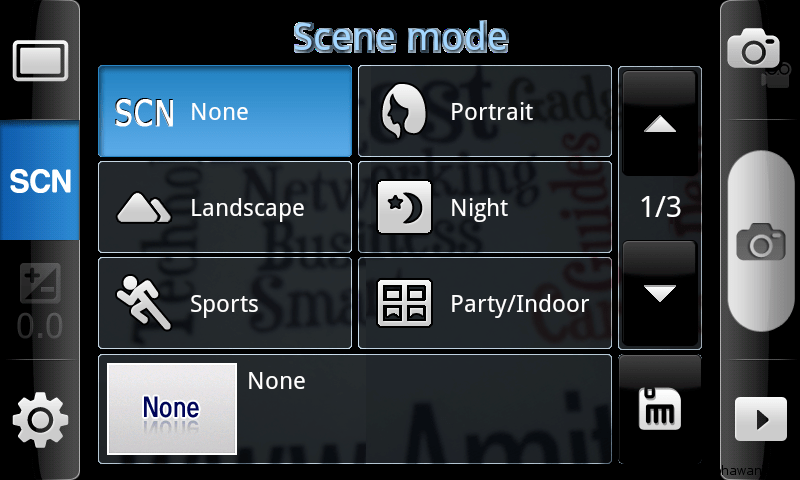 SCN : This option is going to allow you to set the Scene Mode which is something like a complete theme selection while taking snaps. You can select any of the Scene Mode ranging from Portrait, Landscape, Night, Sports, Party / Indoor, Beach / Snow, Sunset, Dawn, Fall colour, Firework, Text, Candlelight & Backlight. Adjust the Exposure value. Use the scroll bar to Increase the Decrease the values for higher or lower exposure. Camera Settings – This option allows you to set some of the basic settings. Here you can set the Focus Mode which by default is at Auto Focus to Macro & Face Detection. This the same option where you can set a timer for taking snaps on scheduled basis. There are a total of 15 different settings available out of which some of the main ones include changing the Photo Resolution from the default 5Mp[2560×1920] to w4Mp[2560×1536], 3.2Mp[2048×1536], w2.4Mp[2048×1232], 2Mp[1600×1200], w1.5Mp[1600×960], 0.3Mp[640×480] & w0.4Mp[800×480]. Switch Mode : This option allows you to quickly change from the Camera Mode to Video Shooting Mode. Capture a Photo or start recording the video once you select the Mode. Click on this single button and everything gets started. In order to stop video recording you will have to click on the very same button again. Image Viewer : This is the last option available on the screen which allows you to view all the last Photos which you have taken using the Camera, instead of closing the whole application and tapping on the Photos section. Anti-Shake : If you select the Anti-Shake feature under these settings then the application will correct shaken photos and make sure they look perfect, this feature is useful when you are using the Camera while driving or moving. Blink Detection : This option allows you to make sure that when you are taking a snap if someone blinks their eyes, the snap wont be accepted and you will be asked to redo the task. Image Quality : This option allows you to select from any of the three pre defined modes ranging from Superfine, Fine & normal. Tools Box : This section allows you to Enable Photo Reviews, Enable GPS on Photos, Change Shutter Sounds and also select the location of the Storage of the snaps. In order to use the Zoom function when you are taking a snap, you will have to press on the Volume Keys In & Out for it to get activated. For focusing on some selected area while taking a Photo, move the focus frame which will give more preference to that selected area. which theme you are using ? mind to share it ? how is the CTR for this theme, would you mind sharing.